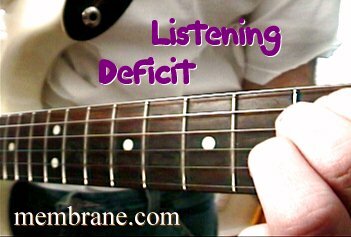 Free Music by Listening Deficit! A New Music Band and Movie / Music Video Project in MP3, Ogg Vorbis, Streaming Video, Real Player, MPEG1, MPEG2 / DVD, MPEG4 / DivX, WAV file formats. What if beings from another planet came to Earth? What if they were already here... could we hear them? How can we expect to hear other beings if we can not even listen to ourselves? Can anyone here hear? Can anyone hear here?